The daily grind can be exhausting even without a drab office space to work in. As more and more people abandon the cubicle in favor of telecommuting or self-employment, a unique opportunity presents itself. 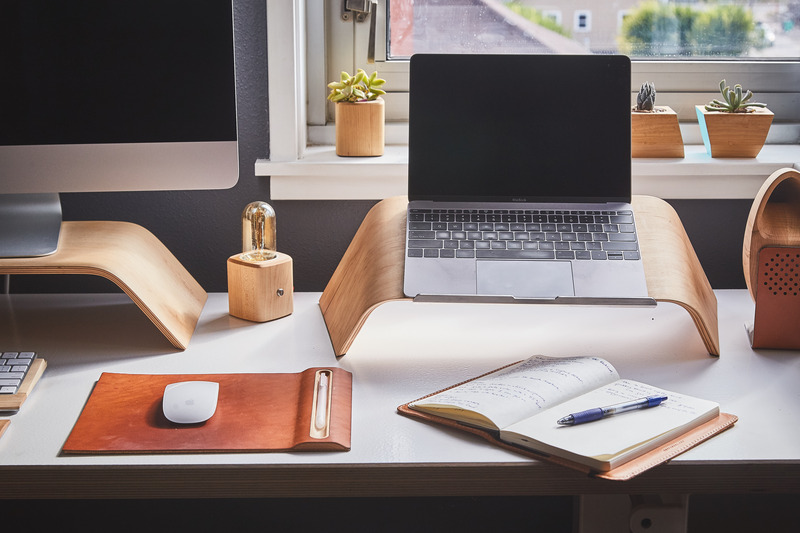 Working from home not only allows you to create your own schedule, but it also gives you the opportunity to create a space that maximizes your productivity. This article highlights the best home office design ideas, listed from the most expensive to the least. No matter what your budget is, you can create a beautiful office space that is worth working for. There’s a fine line between form and function. When selecting your home office furniture, try to envision your daily tasks and the overall theme of your space. An office desk doesn’t necessarily need to be boring. Remember that your desk is going to be one of the most expensive furniture pieces in the room; it should make a statement as well as serve a purpose. Keep in mind the total scale of the room. There are several computer desks that offer built-in shelving and storage. However, these pieces can easily overpower a smaller room. Instead, consider purchasing a single unit and break up the storage areas with credenzas or wall-mounted shelving. Also consider ergonomics, or how efficiently you can complete tasks with the furniture. If you’re using the desk for electronics, make sure there is ample room for your monitor and keyboard without excessive clutter or discomfort. Although rugs can be one of the more expensive home office design ideas to implement, choosing the right style can create a powerful design feature. Consider the texture, size, and design before making your final purchase. Purchase a rug that inspires you or emulates your style. If you have a rolling chair, you might consider a loop or a low-pile and loop combination for ease of movement. Make sure the rug comfortably encompasses your desk and chair and allows you to move freely without rolling over the edges. In your own home, you’re free to implement any home office design ideas you choose. Take full advantage of this freedom by accessorizing your office with objects that are unique to your tastes and interests. There isn’t a right or wrong way to accessorize; however, there are a few rules of thumb you can practice to ensure that your home office design ideas take off without a hitch. Try arranging your accessories in clusters of odd numbers of varying sizes. For instance, if you are showcasing your snowglobe collection, try clustering the globes in threes, with small, medium, and large pieces. Balance the number of accessories in your office. If one side begins to look cluttered, transfer a few accessories to a space that looks scarce. Finally, always review the overall scale. Accessorizing symmetrically isn’t necessary but applying the same scale to each side of the room adds harmony. For example, if you have a larger accessory on one side of the room, try to balance it by placing a cluster of smaller objects or another large object on the opposite side. Nature has a way of soothing our inner stress-monsters. Decorating with flora is one of the most simple, yet effective home office design ideas to implement. Several studies have been conducted on the benefits of plant-life in the workplace. A few of the key benefits include stress reduction, increased productivity, and enhanced air quality. Reaping in these benefits is as easy as visiting your local greenhouse. If you’re concerned about the efficiency of your green-thumb, try purchasing a few low maintenance plants, such as a rubber plant, snake plant, or pothos. Color theory is a science that many designers put into practice when they design corporate offices. The right color can inspire workers; the wrong color can create drab, depressing spaces with unhappy employees. There isn’t a magic color that works for every home office. Choose a color that complements the type of work you need to complete. For example, blue has been found to be a mental stimulant and best suits offices where productivity is essential. However, if you’re looking for design inspiration and creativity, it may not be the color for you. You might consider yellows, oranges, or greens instead. Keep in mind that color doesn’t necessarily equate to paint. Try incorporating color schemes through accessories or textiles, while keeping your walls airy and neutral. Clutter is a home office’s worst nightmare. It can overstimulate the mind and create an atmosphere that creates tension and reduces productivity. Keep clutter at bay by carefully keeping your paperwork and tools tucked away. In addition, you can organize anything that is placed on shelves to become stimulating and aesthetically pleasing. When organizing your shelf space, try to group items to maximize the visual effect. There are several ways you can do this, such as separating clusters with accessories, grouping items by color, or using colorful magazine holders. If you find yourself escaping from your home office frequently, it might be time to spruce things up. Luckily, there are several home office design ideas that you can use that will create an inspiring workplace. Select furniture that is not only functional but makes a statement. Never underestimate the power of accessories, such as personal artifacts, rugs, interesting shelving units, and even plant-life. Finally, play close attention to the colors you choose. Whether you’re an accountant or an artistic freelancer, the colors used in your office can completely change your perception. Don’t settle for a bland work environment; try these home office design ideas to create a unique space that inspires you.